on the 9th to see it live! 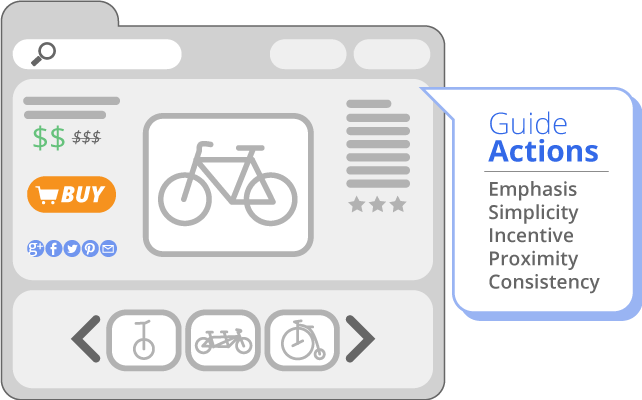 In our last post about user experience, we provided two tips to help you identify some goals for your site and your users. In this post we’ll share another two tips; you’ll learn how to steer users around your site and how different use cases (desktop or mobile) require different setups. Users should always know what action to take next on your site. When a user lands on your page it should be very clear what they should pay attention to first, second, and so on. There should also be a clear next action for them to take whether it's clicking “buy” to make a purchase or reading a related article. 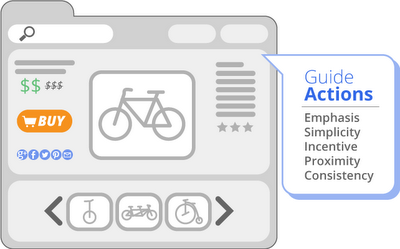 Emphasis: Give emphasis to the call to action by its size, color, contrast and/or use of white space. Simple: Don’t clutter your page with too many different actions. Really think about what you want your users to do and prioritize those actions in your design. Proximity: Make sure your call to action is in a logical placement on the page. For example, if the page features an article, you may want to put the call to action below the article. Consistency: Have your call to action show throughout the site and keep its appearance consistent. Your site needs to provide a great experience to users whenever and wherever they need it. It’s important to put some thought into how your users use your site differently in different situations. Be sure to consider their time constraints and whether they are on a mobile device or a computer. Situation: What situation is the user in that caused them to seek out information on your site? Limit features: The mobile version of your site should only include the core features of your site that will help your users find the information they’re looking for. Save the other advanced features for your desktop site where your users have a little bit more time. Speed: Users only have a couple of seconds so make sure your site loads lightning fast. Google’s Page Speed tool can help you optimize your load time. Forgiveness: Users make mistakes, especially on mobile. Let them easily undo and return to where they were, without having to use the back button. Suppose you’re a restaurant review site. 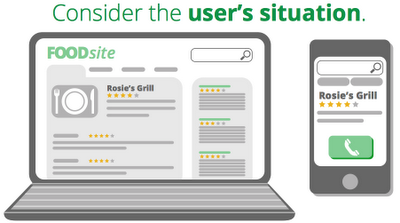 How does a mobile user’s behavior differ from that of a desktop user? First off, mobile users are probably on the move; they could even be walking down the street as they browse your site. They won’t have time to navigate through several pages of restaurants like they do on the desktop site. They expect your site to use the phone’s GPS to locate them and show them popular restaurants nearby based on their search. Your site can even optimize the review experience for mobile by showing the most popular short reviews since users don’t have time to read long reviews. 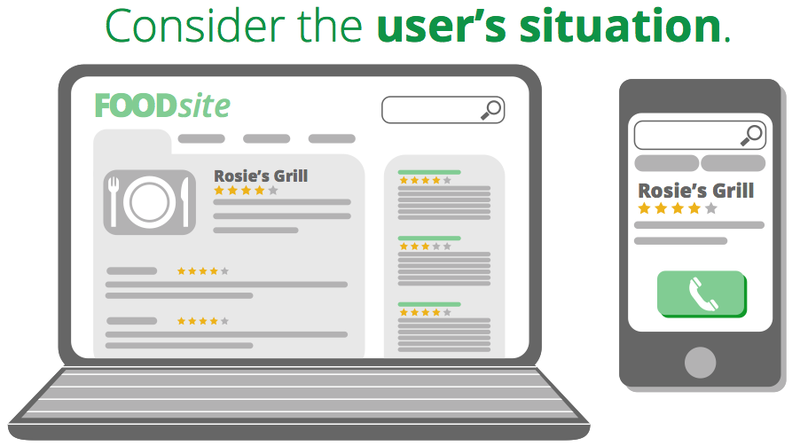 Remember, it’s all about thinking about the situation that the user is in when they reach your site and tailoring the user experience to match. Check in tomorrow and we’ll talk about generating return visits to your site and creating customer loyalty through a great UX. Measure the impact of design changes and monitoring the continued usage of your site will keep you updated on how your users are interacting with your site, and how their usage can shift, change or evolve over time. Google Analytics Events will help you measure these changes by measuring clicks on pre-defined elements of the page. Google has provided some great tools to helping improve your site speed. Google has created a quick tool to see how your website looks on a mobile phone. It also provides some great resources to help build your mobile site. Duda Mobile is a partner with Google GoMo and allows you to create your mobile site in minutes. This is the second of a three-part series highlighting five user experience principles to keep in mind when designing your site. Using these principles will help provide a great experience for users on your site. After the next post we’ll host a live Google+ Hangout on October 9th at 10:30am PT with an AdSense publisher. We will be applying these principles to help improve their site! Visit the AdSense Google+ page on the 9th to see it live!